This month’s Document of the Month features the image of a bogus government bond from the imaginary state of Poyais in Central America. The bond, signed by a man claiming to be the country’s President, General MacGregor, would invest the speculative capital of the purchaser in this new country and its capital city, St Joseph. According to President MacGregor, Poyais had risen, like so many other Central and South American countries, from the declining Spanish Main. In 1823 General Sir Gregor MacGregor, self-proclaimed Cazique of Poyais, visited Britain to encourage Scottish emigration to what he described as a thriving population who had found their fortune on the streets of St Joseph and in the gold mines of the balmy country that surrounded it. One Scot swapped his sterling for Poyaisian dollars, bought some bonds in the country (like the one shown here) and boarded ship in Leith with a promise that he was to become the director of the St Joseph Opera House. However, when the emigrants arrived they found that there was no St Joseph at all; no opera house, no gold mines, no thriving population (apart from some deeply suspicious Miskito Indians – after whom, rather than the insects, the Mosquito Coast is named) and no habitable European settlement. They had in fact invested their savings in tracts of jungle impossibly far from the nearest source of provisions and impregnated with the tropical diseases so fatal to European constitutions. 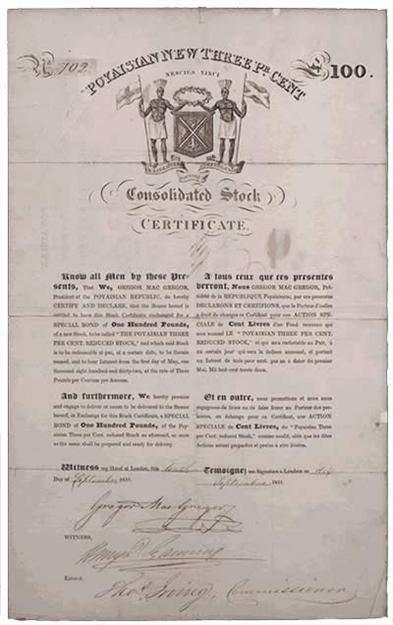 Gregor MacGregor (he was not a general in any recognised army, nor had he been knighted in Britain) sold similar stock certificates and other Poyaisian material in both Britain and France during the 1820s and 1830s. Despite the clearly fraudulent nature of his promises, Mac Gregor was never convicted of any crime – although he served a short jail term in France awaiting a trial that never came about – and eventually retired to Venezuela where he wrote his autobiography (handwritten notes for which are also in the National Archives of Scotland, reference GD50/112). Know all Men by these Presents, That We, GREGOR MAC GREGOR, President of the POYAISIAN REPUBLIC, do hereby CERTIFY AND DECLARE, that the Bearer hereof is entitled to have this Stock Certificate exchanged for a SPECIAL BOND of One Hundred Pounds, of a new Stock, to be called “THE POYAISIAN THREE PER CENT. REDUCED STOCK”, and which said Stock is to be redeemable at par, at a certain date, to be therein named, and to bear Interest from the first day of May, one thousand eight hundred and thirty-two, at the rate of Three Pounds per Centum per Annum. And furthermore, We hereby promise and engage to deliver or cause to be delivered to the Bearer hereof, in Exchange for this Stock Certificate, a SPECIAL BOND of One Hundred Pounds, of the Poyaisian Three per Cent. Reduced Stock as aforesaid, so soon as the same shall be prepared and ready for delivery.